The bane of all mobile app developers is the need to rewrite the same app over and over again for different devices: the iPhone, Android, Blackberry, Palm Pre, Nokia, Windows Mobile. Adobe is positioning its Flash platform (which includes the Flash player, AIR, developer tools, and media servers) as the write-once, deploy-anywhere solution for both the mobile Web and apps. Today at the Mobile World Congress in Barcelona, Spain, it will announce plans to bring Adobe AIR to mobile devices, starting with Android and Blackberry phones. AIR is currently used to create desktop applications, but it will soon be used to create Android and Blackberry apps as well. These mobile AIR apps will be able store data locally on the phone, access other data on the phones such as photos, and be distributed as regular apps in the Android and Blackberry app stores. Not only that, but the same apps created with Flash developer tools will be exportable as iPhone apps. Adobe wants developers to create their apps using its developer tools and then output them as AIR apps for Android and Blackberry phones, native iPhone apps, or Flash apps on the Web. With the upcoming Flash 10.1 player—which Adobe is publicly saying will come out in the first half of the year via an over-the-air update, and privately telling developers to expect by the end of April—it will extend the Flash runtime to mobile browsers. The Flash 10.1 player will run consistently across both the desktop and many mobile browsers (except the iPhone). No more Flash Lite (except for Windows Mobile, which initially won’t support Flash 10.1 but is working on a mobile browser plug-in). Flash 10.1 will be great for mobile video. Brightcove, for instance, is announcing support of Flash 10.1 in its video players, which makes possible all sorts of custom video player skins, advertising, analytics, and other features such as share buttons for Facebook and Twitter. (See this video to see how Flash 10.1 will look in a Brightcove player on an Android phone). Of course, the face-off with Apple continues over Flash on the iPhone, even though last December, 7 million iPhone users attempted to download the Flash player from adobe.com through their mobile browsers, up from 3 million requests in July, 2009. Apple might eventually have to cave if Flash becomes a standard feature of all other smartphones. 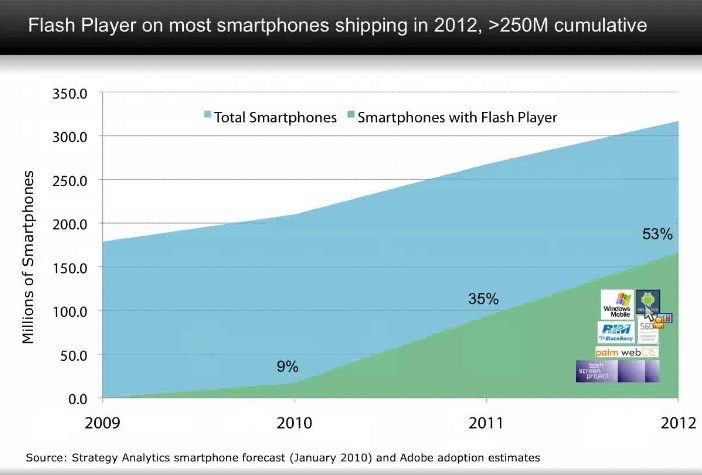 Adobe execs cite numbers by Strategy Analytics which estimate more than half of all smartphones will support Flash by 2012 (click chart at right to enlarge). Flash in mobile browsers seems like an inevitability. But whether apps built for Flash will be able to compete as standalone mobile apps outside the browser is still up in the AIR.